Climate change induces endosymbiotic archaeal growth and evolution of a new human species. Global warming induces endosymbiotic archaeal and RNA viroidal growth. The primitive archaeal DNA is integrated along with RNA viroids which are converted to their corresponding DNA by the action of redox stress induced HERV reverse transcriptase into the human genome by the redox stress induced HERV integrase. The archaeal DNA sequences that are integrated into the human genome forms endogenous archaeal human genomic sequences. The endosymbiotic actinidic archaea forms the basis of life and can be considered as the third element in the cell. Thus actinidic archaea are important for survival of human life and can be considered as crucial to it. Symbiosis by actinidic archaea is the basis of evolution of humans and primates. The increase in endosymbiotic archaeal growth can lead to the induction of homo neanderthalis. 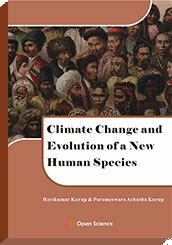 Climate change leads to human evolution and species change.